Small farmers are used to inter-crop, growing several crops together in order to cover the risk of a crop failure and anticipating on erratic rainfall. In Tanzania for example the combination of Maize and Beans and Pigeon pea is very common. If more than one crop is cultivated and harvested with different growing cycles, farmers can use their time more economically. Pest and disease incidence is lower with inter-cropping. Crops can benefit from each other. For most crops inter-cropping creates a more favorable micro climate. In many countries, especially in Africa, growing Jatropha is being seen as a typical smallholders and outgrowers activity. Farmers are promoted to simply interplant their subsistence crops with Jatropha. This is not!! a good development!! Since farmers grow food crops on better soils, automatically there will be competition. In simple words: where you plant a bean, you can not plant a Jatropha and vice versa!! On the other hand, planting more than one crop in the same field can have many advantages, provided a proper planting model is implemented. Companies and NGO’s are promoting temporary intercropping of Jatropha until the Jatropha stand becomes to dense. They say, it gives the farmer an income during the time that the Jatropha is not yet yielding. This system suggests however that a farmer can survive on Jatropha alone, which is actually not (yet) the case. A farmer still needs food, even after the Jatropha starts yielding. On top of that, a dense Jatropha stand does not produce optimum yield because of lack of light and plant competition. So temporary intercropping in a subsistence farming system is fooling the farmer. I have seen many intercrops not growing, because the Jatropha was to big and competing for moisture and sunlight. 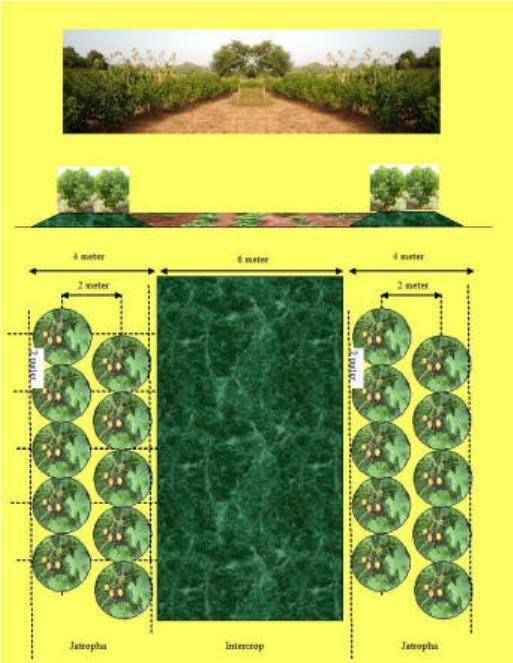 Integrated farming system with Jatropha and food crops. To be successful in intercropping Jatropha with other crops (or other crops with Jatropha), farmers should handle every crop with the same care. Forget about the story that Jatropha does not require much water and grows on any soil. The production of Jatropha should be embedded as in a normal mixed farming system, with all its needs and attention. Even more, growing Jatropha should go hand in hand with improved agricultural practice for food crops as well, like using better seeds, planting in time and in rows, weeding , using fertilizer or organic manure, etc. etc. This means that in Jatropha promotion programs farmers should not be compensated with money, but they should be compensated with good agricultural practice training, proper seeds or plants and fertilizers. It means that by planting Jatropha, the food production area increases as well!! Under coordination of Max Havelaar Netherlands, Fairtrade Labeling Organizations (FLO) carried out a feasibility study into the Fairtrade certification of Jatropha. This project has been supported by the Global Sustainable Biomass Fund, a fund commissioned by the Ministry of Foreign Affairs and implemented by NL Agency. Other partners in the study in the consortium with Max Havelaar and FLO were the development organization Interchurch Organization for Cooperation and Development (ICCO), the Dutch energy company Eneco and the Tanzanian farmers union Kagera Co-operative Union Ltd. (KCU) in Bukoba. c. contributing to improved farm management, diversification, better local access to energy and additional income on household and community level. 3.Prove that Jatropha seedcake is as good as organic manure as a fertilizer. 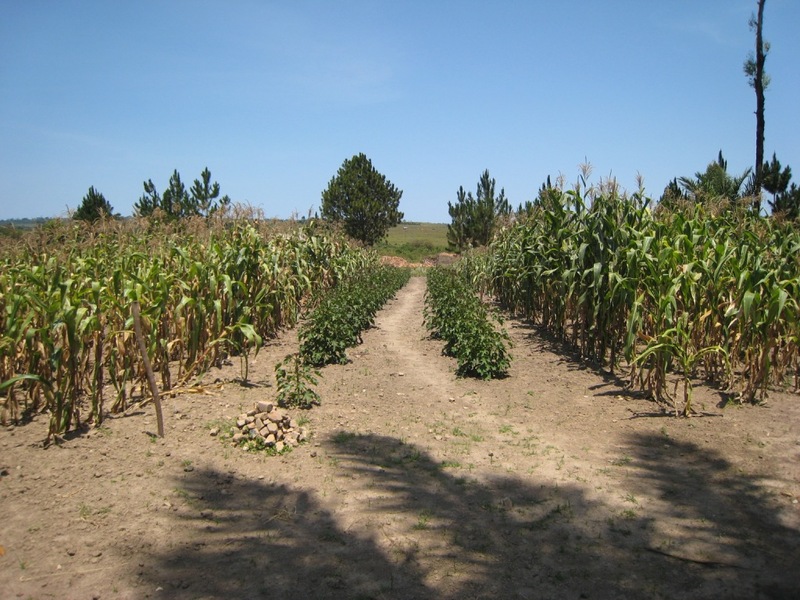 In this demonstration trial it was easy to increase maize yield by more than 100% (compared to farmers practice) through implementing sound and simple agricultural practices. The above mentioned trial was repeated in the 2012 rainy season with even better results, as shown on the graph below. If the farmer is a cooperative member, he probably shares in the profit or the savings (in the case of own energy production) the cooperative makes with the Jatropha oil. Initially poor soils will result in poor harvests. You get nothing for nothing. However, in due time a couple of systems are going to work. Jatropha will gradually develop into a large shrub, providing shade and/or shelter to other crops (depending on planting distance). Furthermore the roots of Jatropha grow pretty deep and will touch layers where the normal annual crops or weeds do not reach. The nutrients picked up from these layers are reaching the surface via the Jatropha plants. Through pruning and shedding of the leaves, the nutrients will return to the surface, enriching the upper layer where other crops are intended to grow. As the seeds from Jatropha are pressed, the remaining seed cake should be returned to the surface, because it is rich in N, P and K, equal or even richer than chicken manure. How can Jatropha benefit from intercropping . Presume growing beans in between the Jatropha. With a row distance of 6 meter between the Jatropha rows the beans have ample space to grow. The beans or other crops will grow between the Jatropha, protected from strong winds and excessive radiation. After harvest the root systems will deteriorate, providing the soil with nitrogen. On top of that the flowering beans or other crops will attract insects, badly needed for the pollination of the Jatropha. Many crops could be intercropped with Jatropha in a way that the intercrop takes advantage of the Jatropha and vice versa. Farmers should concentrate on the local market. Whenever they can make a good price for melon, they should grow melon in between the Jatropha. The melon crop will make sure that the Jatropha plants get pollinated by insects. Same counts for ground nuts, cow peas, pigeon peas , sweet potatoes, peppers, maize,etc. In principle you should not grow Jatropha in a forest, because the forest creates shade and Jatropha needs sun! However, Jatropha plants could take advantage of existing trees (Acacia) or introduced trees (Prosopis*) because those trees attract insects badly needed for pollination of Jatropha flowers. So why not interplanting Jatropha rows with this kind of pollinator trees. The moment they become to big the wood can be used for charcoal production or even firewood, creating a sustainable source of firewood and charcoal. Some of the trees are also oil producing (Azadirachta and Pongamia) or nitrogen fixing (Pongamia and Faidherbia albida). Faidherbia albida (Acacia albida) could be a very good intercropping tree in the dryer parts of West Africa, because it drops its leaves during the Jatropha growing season and it gets leaves when the Jatropha goes dormant and drops the leaves. These trees are potential locations or food for bees as well. And the bees are important pollinators for Jatropha and intercrops. *There are many varieties of Prosopis and Acacia and some become a noxious weed under certain circumstances. Be sure you verify the characteristics of a plant before introduction. Plant Jatropha in hedges along boundaries. Boundaries are everywhere. 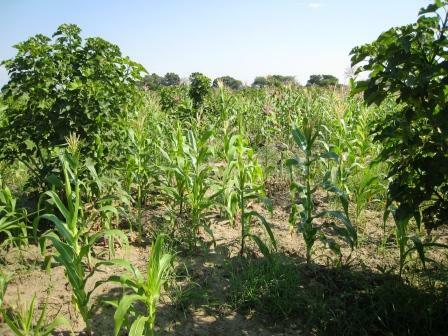 Housing plots, streets, canals, maize fields, soccer fields; they all have boundaries, requiring maintenance. So most of the time these boundaries become a mixture of poles and trees and wire and weeds or in other words, they become a mess and a burden. Why not planting all these boundaries with Jatropha, providing income in stead of costing money. Hedges can produce a lot of seed. It is estimated from a project in Mali (by Henning) that a hedge could produce 0.8kg per meter/per year. So if an average farmer has a plot of 0.5 ha (100×50 m), he can plant 300 mtr of Jatropha hedge which will bring him 240 kg of seeds. And so will his neighbour, and his neighbour etc. etc. (50 % if they have mutual bounderies of course!) A km of Jatropha hedge can produce 800 kg of seeds.! Critics are doubting that you can get enough volume out of a smallholder farming system. However, there are plenty of examples that you can! Think about coffee and tea and cotton and strawberries! Even a lot of oil palm is grown by smallholders. On top of that, the Mali estimation comes from a very dry area and with an increase in rain you will get an increase in yield of Jatropha seeds. How much? We do not know. Agronomists in Jatropha projects are either very secretive or ignorant about collecting data. This is one of the biggest obstacles for the development of Jatropha. Even the owner of the hedge on the picture below did not know how much he picked from the hedge. He only knew it was not enough to run a generator. But he could still recollect the moment he planted the hedge. That was 10 years ago. Why? He did not know either. Probably to make soap which was very popular at that time.